The Estrela Mountain Dog takes its name from the Serra da Estrela, a mountain range in mid Portugal. Because of its remote location, it is impossible to determine the origin of the breed, but it is believed to be one of the oldest breeds of the Iberian Peninsula. In the summer, shepherds moved the sheep up to the high mountain pastures where the Estrela Mountain Dog guarded the flocks. In the winter, when sheep were moved to the foot of the mountains, these same dogs guarded the shepherd’s households and occasionally served as draft animals. During the 1930s, Portugal underwent a revival of interest in their native breeds, and produced the first breed standard for the Estrela in 1933. The earliest dog as recorded by the American breed club was brought into the United States in 1998, although it is known that some were imported several years earlier. 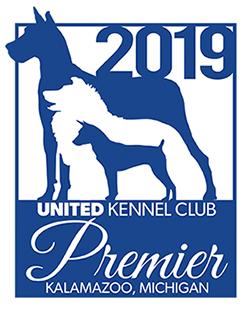 The Estrela Mountain Dog was recognized by United Kennel Club in 1996. The Estrela Mountain Dog is a large, powerful, athletic dog, strongly muscled with substantial bone. 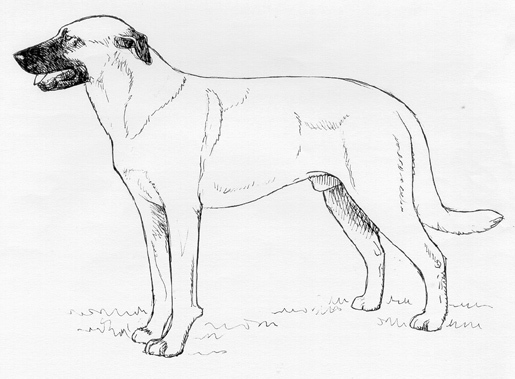 The body is short backed, and the head is in proportion to the size of the dog. The Estrela comes in two coat varieties and coat colors include shades of fawn, wolf gray and yellow, with or without brindling, white markings, shadings of black throughout the coat or a dark facial mask. Estrelas have uncropped, small, triangular rose ears. The thick tail hangs down when at rest and should have a natural “hook” resembling a scimitar. The Estrela Mountain Dog should be evaluated as a working livestock guardian capable of protecting stock in mountainous terrain, and exaggerations or faults should be penalized in proportion to how much they interfere with the dog’s ability to work. The Estrela Mountain Dog is a faithful watchdog of the herds he protects, and a formidable opponent for any predator. This breed is intelligent but independent; loyal and affectionate to owners but indifferent to others; calm but fearless, and quick to react to danger. The Estrela Mountain Dog is a wonderful guardian of property and home, and can also be trained as a draft dog. The Estrela head is strong, big, long and slightly convex. It is in proportion to the size of the dog. Viewed from the side, the skull and muzzle are of equal length, and joined by a stop that is not very marked. The skin on the skull and cheeks is smooth. The Estrela Mountain Dog has a complete set of evenly spaced, white teeth meeting in a scissors bite. An even bite is acceptable. 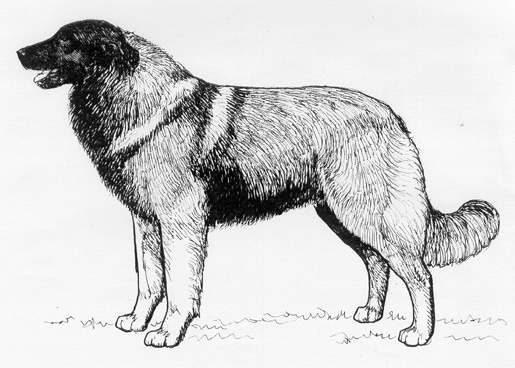 A properly proportioned Estrela Mountain Dog is slightly longer than tall, with a compact body and a short back. The chest is wide, well-rounded and deep, but not barrel shaped. The back is short, strong and nearly level from the withers to the slightly sloping croup. The loin is short, wide, muscular, and deep. The underline rises gradually from the sternum to the groin. The Estrela Mountain Dog comes in two coat types. Both types should have coat resembling the texture of goat hair.